LEGG offers a comprehensive range of belt profiles. For optimum performance even under the toughest of conditions all profiles are integrally molded into the belt using rubber cleat extrusion. V-Cleat handles everything from rocks to asphalt and has an excellent product traction, exceptional wear resistance and it’s full width slitable manufacture. 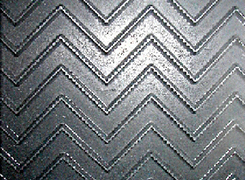 Like V-Cleat the Super V profile features a 1/4"H x 3/8"W repeating chevron. The difference lies in the greater distance between the V-shaped elements. The Mini-Bite is excellent for handling fine bulk material such as grain, nut shells, sawdust, etc. and is full width slitable. The triangular continuous chevron makes this pattern an excellent choice for efficient high incline conveying. The Stone Slinger profile features exceptional 10’’ wide chevrons. The chevron shape of these cleats provide optimal movement of the product towards the center of the belt and the ½" x ½" cleat gives great bite to the product. The Mega-Bite has a ½" x ½" bucket pattern with exceptional material bite. The angled cleat enables for a quiet vibration free return. The Mega-Bite II gives extreme bite to products going up steeper inclines. The inward slant of the cleats keeps product movement to the center of the belt. Maxi Bite features a repeating 1/4"H x 3/8"W bucket top profile and is full width slitable. The chevron style cleat offers hours of service life moving bulk material up an incline. The pattern and the bevel of the cleats provide a quiet and smooth return. The Atlas with its chevron shaped and massive cleats will deliver the product up a steep incline. It is available in all the Legend and Champion carcasses. Tract-R-Tread's 1" x 1" cleat pattern offers incredible material bite while maximizing water and small material roll back. LEGG Company manufactures a wide variety of cleat heights integrally molded during the initial curing of the base belt for a 100% homogenous product. Mini-U has a small 3/16" x 5/32" U-pattern for conveying the finest of materials. Our Roof Gravel pattern consists of 45 degree chevrons, 2’’ in height.